These photographs first appeared February 23, 2000. Send your photographs for inclusion in this rotating gallery! 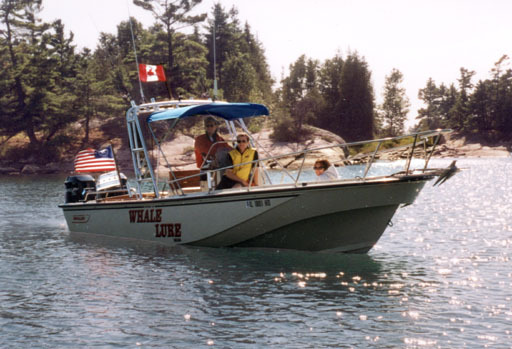 Spotted near Pointe-au-Baril on the fabulous Small Craft Route of the eastern shore of lower Georgian Bay in August of 1999, this larger Whaler pauses for a photo-op. Her flying top is set. On her full transom she has grown a bracket to mount twin outboards. A custom anodized aluminum arch carries her antennae. This same cetacean was seen a few months later in southern Florida, showing the immense range of their migration In this winter view her forward shelter is set. Specialized fishing apparatus have appeared on her arch. 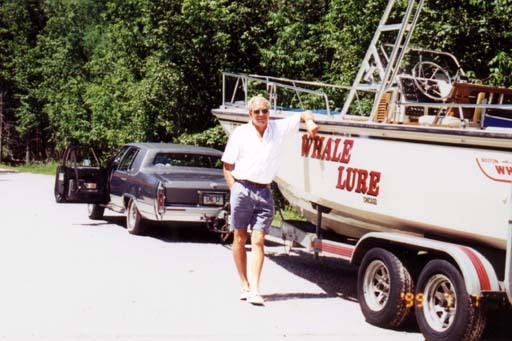 A prime example of adult male pilot, Larry Goltz, seen here in Northern Michigan with his companion cetacean. For towing a Classic Whaler you can't beat a classic car: a 1991 Cadillac Fleetwood Brougham. With a 5.7L V-8, Posi-Traction 3.70 HD differential, and a Draw-Tite weight distributing hitch to handle the 800 lbs of tongue weight, it's a Suburban in disguise. The trailer has 4-wheel disc brakes, too. Together they rumble down the highway at 60 MPH and 7 MPG. In the warm, shallow coastal waters of Florida, a rarely seen progenitor of the Outrage shows her unusual ribbed hull. Later evolution smoothed the ribs of this species. The blue pigmentation seen here has been acquired environmentally; at birth she had Desert Tan gelcoat. A diminuitive secondary propulsion mechanism and specialized fish catchers have also evolved. Three male pilotfish accompany her, typical of the symbiosis and companionship between these species. Larger whale(r)s are often found in the Great Lakes. 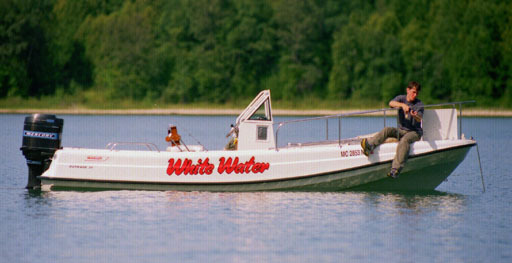 At the Northernaire Lodge in Bayfield Sound on Manitoulin Island, Ontario (in the North Channel of Lake Huron) this 1973 Outrage 21 takes Jason McIntrye fishing. Her console has been raised four inches and her unique windshield the result of some cross breeding with an older Mako. All her teak is varnished, and electrical wiring redone. 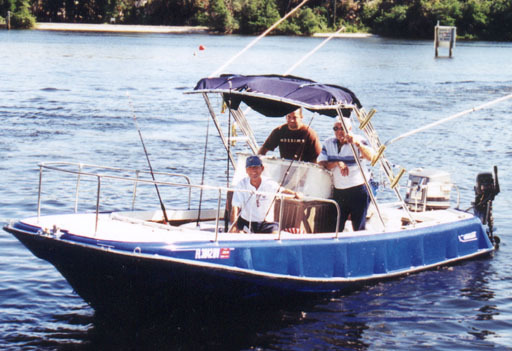 Future projects include re-powering with a 200 HP Yamaha, more interior seating, and a sleeping platform in the bow. The Montauk genus of the whale(r)s has shown amazing ability to adapt. From her original waters of the Atlantic Ocean, this 20-year-old specimen has migrated inland all the way to Idaho, thriving even in the high altitudes of mountain lakes like this one, Henry Lake just west of Yellowstone National Park. 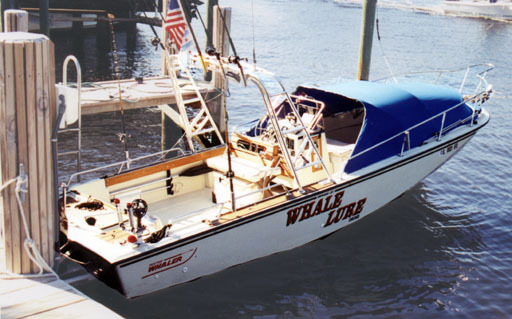 Russ Bauer is nursing this little 29-year-old whale(r) back to health, giving her a new 25 horse outboard and an occassional shot of the hometown product of Chippewa Falls, Leinenkugel Beer. (Leinenkugel's Red Lager is one of the great joys of boating in Wisconsin!) By next summer that wood will be redone, too. 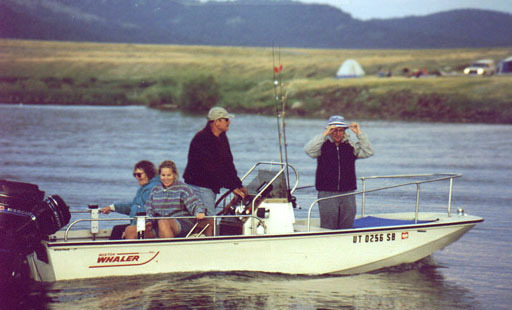 Russ says his girlfriend thinks he's obsessed with the boat; we hope she endures 29 years on the water as well!